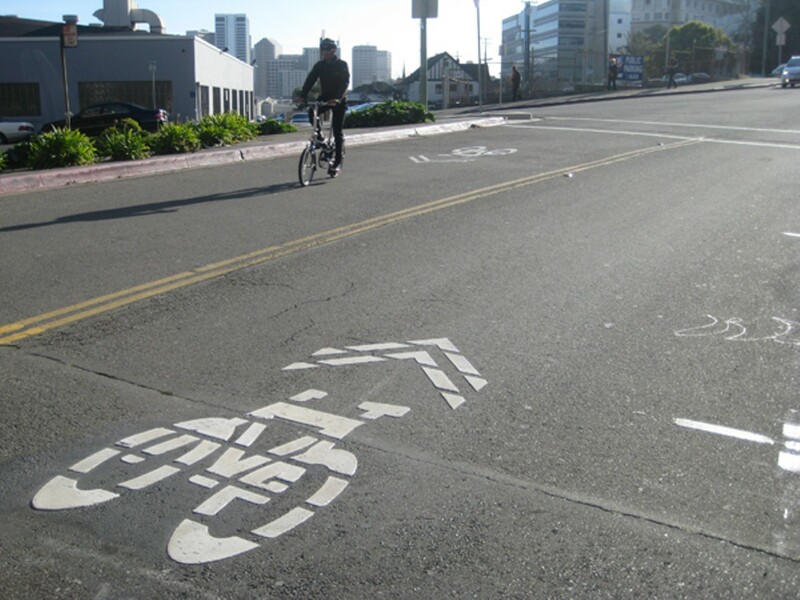 An innovative bike lane and more than forty miles of new bikeways are in store for Oakland. New sharrows on Webster Street offer bicylists an easy route through Uptown. In September 2010, the League of American Bicyclists recognized Oakland as a Bronze-Level Bicycle Friendly Community, along with 140 others across the country. This was all well and good, but not quite good enough. The following January, in an interview with the website Oakland North, Jason Patton, the city's Bicycle and Pedestrian program manager, announced that 2011 would be "the biggest year ever for implementing new bikeways in Oakland." Yet 2011 might turn out to be nothing compared to 2012. "It's gonna be a big year, no matter what," Patton said earlier this month. In fact, over a fifteen-month period extending from late 2011 through 2012, the city should nearly double its existing network of bikeway striping, from 33 miles to 62. That's fourteen years of work matched in a single flurry of activity. Some of the larger projects included in that jump are 1.9 miles of sharrows (signs painted on the pavement near the middle of the lane that encourage bicyclists and motorists to share the road, and direct cyclists where to ride) on Foothill Boulevard; 2.3 miles of bike lanes and sharrows on 16th and Ardley avenues in East Oakland; and 2.7 miles of sharrows on Webster Street and Shafter Avenue between 29th Street and the Berkeley border. In addition to the 21.2 miles of new bikeway striping planned to go in this year (triple 2011's 7.1 miles), the city will see 21.1 miles of new or upgraded "wayfinding" sign projects (versus only 7.9 in 2011). Still more miles are anticipated for 2013, perhaps promising redemption when the League of American Bicyclists revisits its ratings in 2014. Among them is Oakland's most innovative bike treatment yet, and one of its most hard-won. Since 1999 the city has sought to install bike lanes on 40th Street in North Oakland, linking Emeryville, Broadway, and MacArthur BART. Planning began in earnest in 2004, and city staff has been working on it continuously since then, Patton said. The latest snag was opposition among neighbors to the notion of narrowing the 40th Street median. Between Martin Luther King Jr. Way and Yerba Buena Avenue, residents had adopted the median as their own in the absence of city maintenance. They'd weeded it, landscaped it, and even irrigated it, but the city wanted to scrap it. Otherwise, there'd be no room for bike lanes. Neighbors didn't budge, so last year the city developed an alternative — one it has never tried before, and has yet to formally unveil. The idea is to combine traditional sharrows with a solid strip of green paint five feet wide, like taking a giant highlighter down the middle of the lane. This design will provide a strong visual reminder for cars to share the road with bicyclists, even if there is no extra room allotted for bikes. If approved, this "super sharrow" will run in the right-hand lane in both directions from Adeline Street to Martin Luther King Jr. Way and then continue on the other side of Telegraph Avenue to Webster Street, where more traditional striping will pick up. Such a bold approach suits 40th Street because of its relatively high traffic speed, Patton said. Without a clear signal that bicycles are welcome, they're liable to get run off the road by impatient or intolerant motorists — despite their legal right to be there. "There's a lot of pressure on bicyclists to get out of the way," Patton said. "We're trying to find a way to make that legal message strong enough in how the street looks." Green paint is approved for use in standard bike lanes in the United States, and San Francisco has experimented with it for so-called "bike boxes," which give cyclists space to wait for green lights in front of cars. Yet the green sharrow lane has been implemented only twice in the country to date — once in Long Beach and once in Salt Lake City — and is not yet considered an approved treatment. So in order to protect itself from litigation, the city must frame its treatment as a short-term experiment. If the paint passes its six-month test, it can stick around. If it doesn't, the city will have to scrape it off and start over. Patton isn't too worried. "I think it's gonna be a pretty dramatic message that we think will change behavior," he said. And the upside is huge: With 96,000 people living within two miles of MacArthur BART — and with 40th Street in Emeryville poised to serve as bicyclists' on-ramp to the eastern span of the Bay Bridge starting in late 2013 — the new $300,000 connection could become one of Oakland's most valuable bikeways. Plus, if the super sharrows work, the city may look to apply them to similarly troublesome stretches throughout the city. Such progress is the stuff of silver, gold, and platinum-rated bicycling communities. Granted, taking the experimental route is a bit out of character for Oakland. Lacking the money and staff to dedicate to bikeway innovations (unlike, say, San Francisco or Portland), Oakland prefers the sort of "bread and butter projects" that are often easier, faster, and cheaper. Patton estimated that in the time the city has spent on less than a mile on 40th Street, it could've installed about fifteen miles of easier lanes. "We kind of reluctantly took this path," he said. "I'm really excited about it, but it's taken us a tremendous amount of time." All the while, nonprofit Walk Oakland Bike Oakland has backed the city's efforts. Its goal is to see Oakland's 2007 Bicycle Master Plan, which calls for a total of 220 miles of bikeways, fully implemented by 2020. With the anticipated progress of the months ahead, the city will pass the halfway mark and land somewhere around 123 miles by the end of the year. That leaves 97 miles, or an average of nearly 14 per year, to reach the organization's goal. On the horizon is a single massive project that could put a nice dent in that number. AC Transit's Bus Rapid Transit plan calls for bike lanes along the entirety of Telegraph Avenue and International Boulevard throughout Oakland. Construction is still years away, but the impact could be huge. "That's a real connection," said Jonathan Bair, president of the organization's board. "It's gonna go all the way from Berkeley to San Leandro. That'll provide the sort of connection we've never had before in Oakland." Together with the East Bay Bicycle Coalition, Walk Oakland Bike Oakland is currently angling to get bike lanes integrated into the Lake Merritt BART Station Area Plan, which could serve as the nexus of a web of connections between Eastlake, Laney College, Chinatown, and ultimately West Oakland via downtown. Bair said he hopes to see bikeways approved with the project's environmental impact report by early next year. Given Oakland's climate, landscape, and progressive ideals, Bair extols its potential as a bicycling city — even if it's often outshined and outspent by its neighbor to the west. Oakland is already ranked sixth in the nation in bike commuting by the Alliance of Bicycling and Walking, and, with upcoming improvements, is bound to climb higher, Bair figures. "There's no reason we can't be the top-ranked city in the country."